Size: 5.5" x 3.3" x 0.7"
The Avigo 10 PDA (Personal Digital Assistent) introduced already in September 1997 uses a completly different approach compared to Texas Instruments' Personal Organizers, e.g. the PocketMate 300. Instead of a spacy keyboard the smaller Avigo 10 uses a bold, touch-sensitive display with a resolution of 160*240 dots. A nice feature, especially for tables, is the ability to rotate the data, viewing it "landscape" rather than "portrait". • A standard graphics keyboard. with the typical three characters per key. The Avigo 10 is bundled with a customized version of the Lotus® Organizer™ 97, the leading personal information management software. It takes control of the calendar, address book, task list, and more. Also included is the IntelliSync™ software to synchronize the appointments, tasks, contacts, and more, directly with Lotus Organizer 97 on the desktop PC. Connectivity with a Personal Computer is accomplished through a Avigo 10 specific cradle supporting a RS-232 interface. Dismantling this Avigo 10 PDA manufactured in September 1997 by Inventec Corporation in Taiwan reveals a very complex, yet high integrated system based on an Application Specific Integrated Circuit (ASIC). The main electronics is compromised of two printed circuit boards (PCB's), the larger PCB hosts the ASIC and memory chips, while the smaller PCB supports the huge, touch-sensitive display. The Avigo handheld PDA is based on a modified Z80 microprocessor, which has a 16-bit memory address bus. That means it can directly access up to 64k bytes. The Avigo Operating System is able to access multiple megabytes of memory using a technique known as "banking" or "paging", selecting 16k banks of extended memory to appear in 2 memory regions as needed. Like most other computers, Avigo memory is designated as RAM and ROM. The ROM however, is EEPROM (electrically erasable ROM), and the operating system and applications can - and do -routinely alter its contents. The 1MByte Flash memory of the Avigo 10 with approx. 680KB available for the user could be expanded with a small 1MByte module. The smaller of the two PCB's supports the touch-sensitive display and uses with the Toshiba 6C23 and 6C24 very high integrated column resp. row drivers. 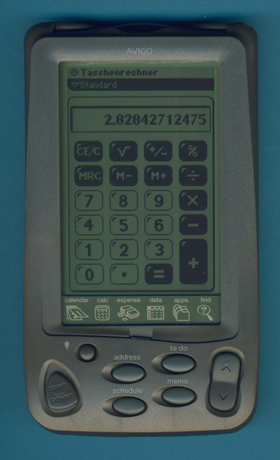 The Avigo 10 had never the appeal of the Apple Newton or the success of the 3Com’s Palm Pilot series. With the introduction of the first Windows CE based PDA’s Texas Instruments discontinued the Avigo. Don't miss the Personal Learning Tool PLT SHH1 based on a very similiar technology!